Classic Monsters of the Movies magazine issue #14 - Lugosi's Dracula - LATEST! 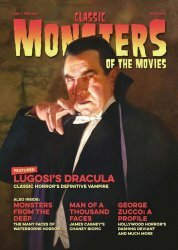 MyMovieMonsters.com > Monster Magazine Marketplace > Classic Monsters Of The Movies (UK) > Classic Monsters of the Movies magazine issue #14 - Lugosi's Dracula - LATEST! Direct to MyMovieMonsters.com from the United Kingdom: The 14th issue of Classic Monsters of the Movies magazine -- continuing the tradition of the great monster mags of yore! Classic Monsters of the Movies issue 14 brings you more of your favorite classic cinema chills, presented as only we know how. This issue's cover feature celebrates Bela Lugosi's many portrayals of Dracula, from his stage career through to the 1931 Universal classic and beyond -- and, of course, the many vampire roles which were oh-so-close to the role that defined his image. As with all our articles, this feature is packed with stills that bring Lugosi's career as Hollywood's leading vampire to life. Fans of Lugosi are, therefore, in for a treat, but there's plenty of other exciting stuff in issue 14 of Classic Monsters of the Movies too. We dip our toes into the weird world of water-borne monsters and examine the aquatic critters of all shapes and sizes that have kept us on dry land over the years. Meanwhile, our biography of George Zucco explores his status as one of horror's most beloved character support stars. Whether as a Mummy-raising evildoer, a mad scientist or a sideshow owner, he never failed to raise a smile and a chill. If Vincent Price is your preferred purveyor of the macabre, then Classic Monsters of the Movies issue 14 is definitely for you, as we take a fresh look at 1964's eerie The Masque of the Red Death. With a touch of Edgar Allan Poe and the kind of gothic brilliance that Roger Corman does so well, this movie always merits another viewing, so join us for a trip back to medieval Italy. Other articles include an appraisal of 1957 Lon Chaney biopic Man of a Thousand Faces -- a chance to examine James Cagney's portrayal of the iconic horror star and the liberties Hollywood takes with reality for the sake of drama. Classic Monsters of the Movies issue 14 is another must-have addition to your monster magazine collection, with beautiful stills and insightful articles bringing your favourite horror movies to life. World-class journalism immerses you in the motion pictures which we love so much, offering a fresh approach to the genre. Wrapped up in clean, timeless design and stunning production values, Classic Monsters of the Movies is a horror magazine you can't possibly afford to be without. Lugosi's Dracula -- his portrayal of Stoker's vampire in Universal's 1931 movie has become the popular face of Dracula, but Bela Lugosi made many other contributions to the way we imagine bloodsuckers. Monsters from the Deep -- there's something particularly threatening about water-based monsters, so it's time to meet hydrated horrors ranging from the golden age through stop-motion and into the world of science fiction. George Zucco -- his unmistakable voice and knowing villainy made him the pantomime baddie of classic horror, but who was the man behind all those unforgettable roles? Our biography explores the life of the man behind the movie malice. The Masque of the Red Death -- Vincent Price presides over a castle full of terrible deeds in AIP's gloriously grotesque spectacle. The dance is about to begin -- make sure you're ready, this is a party you'll never forget! Invasion of the Saucer Men -- this issue's Kitsch Corner takes a journey to the heart of sci-fi Americana with some of the most extraordinary aliens you've ever seen. 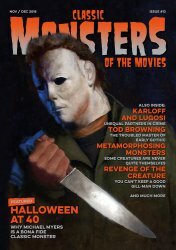 Issue 14 of Classic Monsters of the Movies is packed with lavishly restored stills printed to the highest quality. Full colour design gives this world-class publication a richness and style that you won't find elsewhere, while professional journalism brings the classic horror movie genre to life. Classic Monsters of the Movies is the ultimate publication for any monster kid. Missed Classic Monsters #13? Use the handy Buy Both button below to order!